Hi! My name's Taylor, and I live in the United States, in the Mid-West. I live with my husband and three kids, and I work full-time outside the home. I am also the author of Household-Management-101.com. Having kids is what got me really interested and serious about the concept of household management. Initially, I got interested in household management because I wanted to get my house clean and organized so that I could get back to the fun parts of life without living in chaos. As I learned more about household management though, I learned that it could do so much more than just allow me to keep my house clean. Effective household management is a way to have a positive impact on my life and the lives of my family. Let me explain how I came to that conclusion, because I know it may not make intuitive sense right away. I must admit that as I grew up I was a bit of a slob, and that continued as I grew up and moved out on my own. I found that I could manage myself, not necessarily well, but good enough to get by without too much hassle. Then, I got married and my husband and I continued to muddle through. We were students after all, so we weren't really focused on home life anyway. Soon after getting married my husband and I had our first child. The addition of the baby amplified the problems we were already facing in our home. Too many times to count my home was filthy, or we were running out of clean clothes, or I kept tripping on junk and toys. My life was not unhappy. I loved (and still love) my family. But, I know I was not enjoying my home and family as much as I could have been because I was distracted by all the chaos. I found myself in a repeating cycle -- my home would get so unbearable that I would clean and organize like a mad woman. Then, after expending all that energy all at once I was so exhausted I didn't have the energy to do any more organizing and cleaning for a while. So, the cycle would repeat and things would get unbearable and filthy again. When my husband and I had our second child, in early 2005, it solidified for me my belief that we needed to improve the inner workings and routines of our home. I was overwhelmed with the family, full-time job, and house. But, getting rid of any of these was not an option. 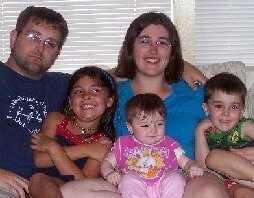 I also knew that all this clutter and chaos was not an ideal way to raise my children. I wanted them to grow up in an environment where they felt loved and cared for, and where I had the time and energy to devote to their needs. I also wanted time and energy to devote to my marriage, and to my own interests. I knew something needed to change - but what, and how? My realization that things needed to change didn't happen over night. Really, I think I knew all along that things could be vastly improved. Therefore, I had already tried to learn about topics such as cleaning, laundry, and organization before. I had a pattern. I would read a book or article about one of these topics, get inspired, try to put some of these ideas into practice in my own home, meet with some initial success, then burn out and lose ground again. It felt like I always fell back into my old ways. I couldn't figure out how to stay consistent and on the right track. I unexpectedly found the solution to my inability to maintain organization, habits, schedules and routines in my house when I read the book, Getting Things Done , by David Allen. This is typically considered a business book, definitely not a household management book. The concept that grabbed my attention was breaking projects into what Allen calls "next actions." How I interpreted this concept, although not Allen's main point, is to take things in small steps. Come to find out, small steps is the concept of a great technique called Kaizen, which is Japanese for continuous improvement. Using the technique of taking small steps has changed my life, my home, and my family for the better. Once I understood and applied this concept the stumbling block was removed, and I started to make progress. That is not to say that my home is now perfect. Far from it. There is always more for me to learn. I have experienced the household management snowball though. As my home improves in one area it also improves in other, sometimes unexpected areas. Once momentum gets started, improvement seems to occur faster than it previously did. For example, I have found that keeping the kitchen clean makes it easier for us to prepare home cooked meals, which is cheaper, so better for our household finances, and it is also better for our health, and gives more opportunity for our family to commune together, sharing meals around the table. But I also encounter new challenges daily. For example, now that I have had my third child the whole family has gone through a period of readjustment. As my husband jokes, with the addition of the third child we have gone from man-to-man to zone defense. With this significant change I have identified some new areas for myself and my family that need improvement. I will tackle these areas as I have the others, with small steps. Such is life. The journey of continuous improvement is never done. I have discovered while taking this journey that every aspect of our lives are interconnected. The household management snowball effects not only the cleanliness of our homes, but also our family's attitudes and feelings. Household management, to me, is not just about cleaning or organization. These are just means to an end. What I am most interested in, and care about the most, is the household -- the people living in the home. My overarching desire has always been that I want everyone in my family (including me) to feel loved and cared for. The only purpose of cleaning, home organization, meal planning, and chores, for example, is to make a positive impact on my life and the lives of my family, to allow me to show them in direct and indirect ways that they are loved and cared for. If an action does not take you a small step forward towards that goal, it is not worth taking in my opinion. I do not advocate organization for organization's sake, nor requiring your home to pass the white glove test. My goal is to find the actions that will make the most positive impact on my family's life, and do that. I am passionate about creating a loving and caring atmosphere in my home, and I believe one of the best ways to do this is by becoming an effective household manager. Therefore, this site is about sharing my philosophy of household management, and is meant to be the how to guide I wish I had when I started my journey. This website explores the topic of staying consistent with household tasks, through the use of habit, routine, and schedules, which is the backbone of household management. It also provides practical, simple advice on how to do certain household tasks, especially focusing on families with children. And finally, the site explores how to involve the whole family in this process. I view families as a team, where everyone, including children, needs to pitch in. This not only helps the whole family now, but also allows the kids to learn the life skills necessary to make it on their own once they grow up and launch into the world. I hope you enjoy the site, and I appreciate any comments you can provide. You can provide home management tips here, and/or contact me here.